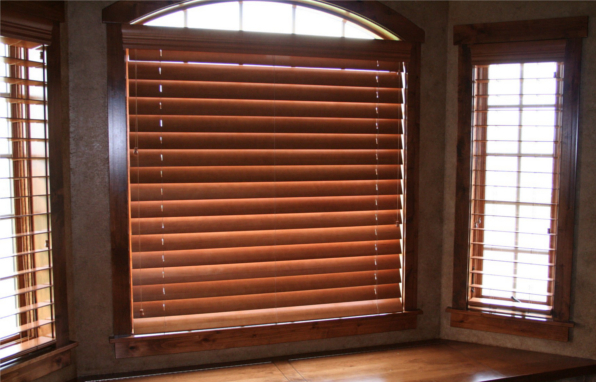 We provide functional, durable, decorative and energy-efficient Wood Blinds in various sizes, shapes and styles. With years of experience and expertise installing wood blinds, our wood blinds have a natural tint which is polished to create interesting visual effect as per the preferences of our customers. Our wood collection is made from bass wood offering you all the warmth and beauty of a solid wood blind. Our beautiful cornice valance adds that finishing touch for a truly elegant look. flexibility you need to accommodate any room decor. Superior components and expert craftsmanship will assure you years of beauty and carefree use. Cord free lock and lift system available.